The Nova Scotia-Gambia Association, in partnership with Saint Mary’s University, presents “Running the Sahara,” a film screening with special guest Ray Zahab in support of Love4Gambia. Purchase your tickets early! Capacity is 200. 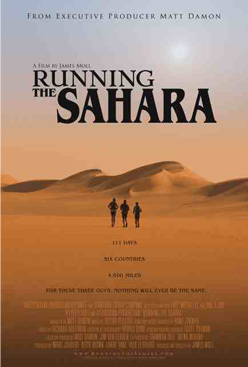 All guests will receive a free copy of “Running the Sahara”, and the chance to meet the star of the film, Ray Zahab! This is incredibly exciting for me personally. I’ve admired Ray Zahab for a long time. Before I made my first Boston Qualifying attempt, my buddies Andrew and Adam and I watched “Running the Sahara” and got psyched for our race. I hope you’ll join me for this special night. This entry was posted in Charity Run. Bookmark the permalink. If Halifax & PEI were closer you could train on the clay roads of Blooming Point and we could take in this event…. hope you have a wonderful evening!